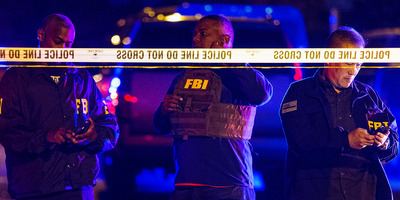 Austin-American Statesman/Nick Wagner via Associated PressFBI agents at the scene of an explosion in Austin, Texas, on Sunday. A package bound for Austin, Texas, exploded at a FedEx facility in a nearby city early Tuesday. One person at the facility in Schertz, Texas, was treated and released at the scene. Four explosions in Austin over the past two weeks have killed two people and left four others injured. 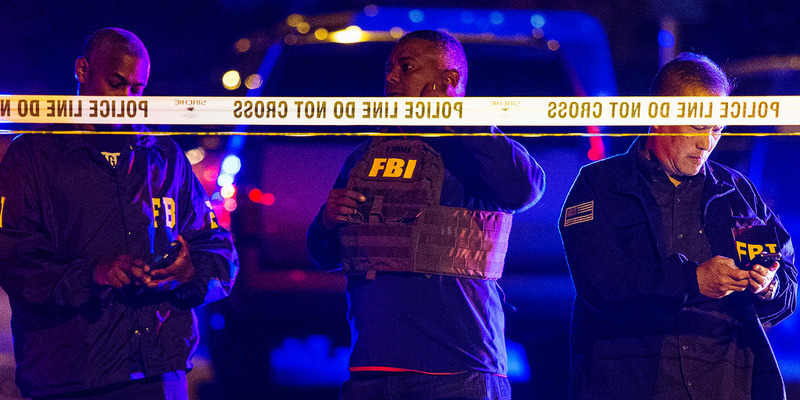 A source told NBC News that the FedEx explosion was likely linked to the Austin bombings. The package, which contained nails and shrapnel, exploded at the Schertz, Texas, facility shortly after midnight local time. It was travelling along an automatic conveyor when it exploded, authorities said. One person was treated by medical teams and released at the scene, The Washington Post reported. A source told NBC News that the latest explosion was likely linked to the four in Austin that have killed two people and injured four others over the past two weeks. Local, state, and federal authorities are investigating it as such. Authorities were also responding to suspicious packages at two other FedEx locations in Austin on Tuesday afternoon, according to local NBC News affiliate KXAN. Police said another device in a package was discovered at the same FedEx location that didn’t explode, according to the Post, but then recanted that statement. Many of the details about the packages, exploded and suspicious, are shifting in a quickly shifting investigation. 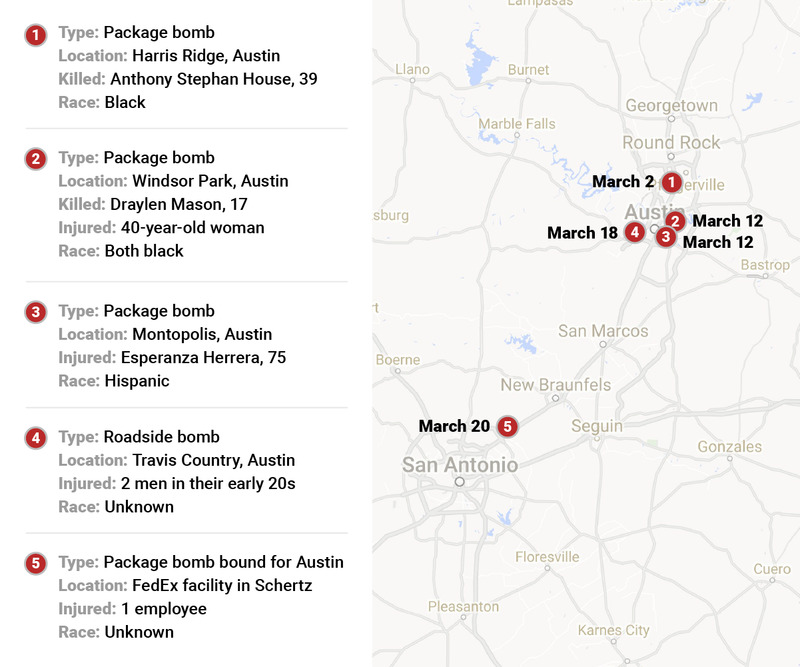 Three of the recent blasts in Austin were caused by parcel bombs dropped off at night in front of homes in Austin’s east side, and the fourth was caused by a tripwire device that detonated farther west on Sunday. The police suspect that a “serial bomber” is on the loose. Samantha Lee/Business InsiderSchertz is just northeast of San Antonio, 65 miles southwest of Austin. Schertz Police Chief Michael Hansen told reporters on Tuesday that Austin was the likely destination of the FedEx package. “We’re confident that neither this facility nor any location in the Schertz area was the target,” he said. He added that people who received unexpected packages or were suspicious of the return address should take precautions. “Do not touch it, do not move it, but call 911,” he said. 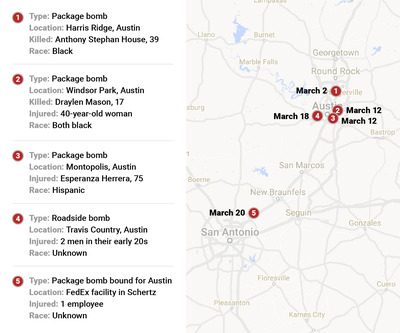 The Austin Police Department has received thousands of calls from people reporting suspicious packages since the first exploded on March 12. Preliminary evidence suggested similarities between the devices used in Austin, the city’s police chief, Brian Manley, told reporters on Monday. Authorities are also investigating whether the perpetrator, or perpetrators, had a “specific ideology behind” the bombings. Two explosions took place at homes owned by black families, while one took place at the home of a Hispanic woman. “We cannot rule out that hate crime is at the core of this, but we’re not saying that that’s the cause as well,” Manley said.